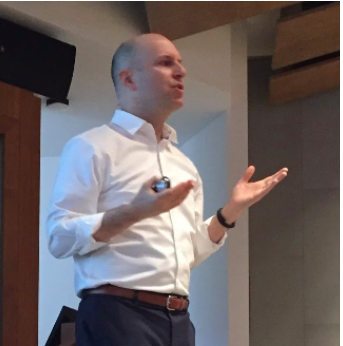 On Monday, April 9, the College hosted Nathaniel Stinnett, Founder and Executive Director of the Environmental Voter Project (EVP), a non-partisan nonprofit that uses big data analytics and behavioral science to identify non-voting environmentalists and increase their turnout to the polls. Sponsored by the Carbon Charge Committee and several academic departments, the event was a component of President’s Sustainability Research Fellow Nicholas DiMaio ‘19’s education- and outreach-focused project. DiMaio’s work focuses on building political will for carbon pricing, and he also helps lead “Put A Price On It” (PAPOI), a student group founded last fall that promotes education on and the implementation of a carbon fee. “I think it is really important to know why people vote. The psychological aspect of that is really appealing and something that Swarthmore students should know,” said DiMaio. DiMaio helps lead PAPOI alongside Climate Action Senior Fellow Nathan Graf, who provides staff support to student leaders on campus. “Effectively addressing our vast environmental challenges requires a full ecosystem of strategies. I’m excited to learn more about the opportunities in targeted voter mobilization to build political power on a specific issue,” said Graf. In his presentation, Stinnett discussed why the EVP was started, how the EVP and other political campaigns have changed the way they target voters, and what the EVP and other “cutting-edge” organizations do to motivate potential voters. “Who you vote for is secret, but whether you vote or not is public record,” he said. EVP is not a lobbying group and does not endorse specific candidates. Rather, the organization seeks to increase the voter turnout among those who identify as environmentalists, the reason being that elected officials and candidates align their priorities with those of voters. “If voters don’t prioritize climate change and environmental issues, there’s no way on Earth politicians will,” he said. The organization currently works in five states: Massachusetts, Pennsylvania, Georgia, Colorado, and Nevada. Before launching the EVP, Stinnett spent his career working on political campaigns. After working on a mayoral campaign, he began looking at polling data and found something that surprised him: there is a “silent green majority” in the United States. According to Stinnett, there are tens of millions of Americans who list climate change or other environmental issues as one of their top two priorities that they vote on. In the 2016 presidential elections, of the 200 million registered voters, 58% turned out for the election, but only half of those who prioritized environmental issues and were registered to vote actually showed up to the polls. In the midterm elections, 36% of registered voters made it to the polls, while only 21% of environmental enthusiasts did. While this may seem alarming to the environmentally-minded and civically-engaged, Stinnett argued that this is actually encouraging news. He contended that this finding gives reason for hope because it means that the focus of the environmental movement can be on changing habits rather than on changing minds. Once someone prioritizes the environment votes, politicians pay attention to that individual and their values. The EVP uses many of the same big data tactics that other campaign groups use, which Stinnett referred to as “Orwellian” in his presentation. Big data entered the playing field roughly a decade ago, and, according to Stinnett, revolutionized everything. Using big data, the EVP builds predictive models based off data-rich voter profiles. From there, once they have profiles replete with your interests, activities, and habits, they begin the polling process. “Once you have data-rich voter profiles, we poll a ton. I mean a ton,” he said. Data scientists then begin finding correlational patterns. Some of the predictive data points that suggest one prioritizes the environment, the EVP found, are 1) employment in the agricultural and forestry industry, 2) giving up a landline phone for a cell phone only, and 3) being a basketball fan. Once this database is formed, each voter is assigned a score from 0-100 that shows how well they fit the criteria as someone “who lists climate change or an environmental issue as one of top two priorities,” Stinnett said. EVP then reaches out to those who score 55 points and above through canvassing, emails, and digital outreach. Rather than emphasizing the issues or the “value of voting” in a cost-benefit analysis, EVP uses what is called Expressive Choice Theory. According to this theory, voting is not about what you want, but rather who you want to be and how you see yourself. The tactic is surprisingly accurate. According to Stinnett, targeting non-voting environmentalists with this rhetoric increased voter turnout by 6.5%. Scoring your voter profile is not a practice unique to EVP. According to Stinnett, insurance companies do the same thing for lifespan probabilities, and other campaign organizations do this for qualities such as your level of persuadability. Regarding ethical questions surrounding the use of big data, Stinnett emphasized the need for groups like the EVP to take advantage of the gains that big data provides. “The people wearing black hats are totally doing this, so the people wearing white hats should as well,” he said. According to DiMaio, this was one of a series of talks that Swat PAPOI hopes to bring to campus to provide students with the opportunity of learning about a wide variety of environmental and political intersections. ← Why are the Bells Back?